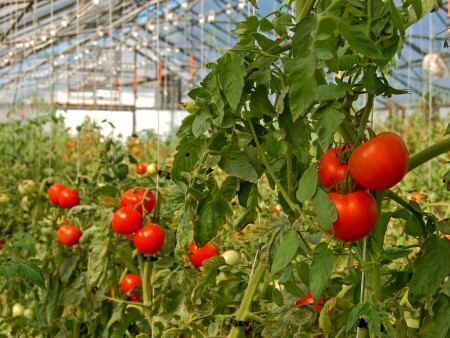 COLUMBUS, Ohio — Even in the dead of winter, consumers can enjoy fresh tomatoes, peppers and other produce, often thanks to the bounty from greenhouses scattered across the continent. Sanja Ilic is trying to make sure those vegetables are the safest possible. Ilic, the state food safety specialist for Ohio State University Extension, often works with growers to reduce the risk of foodborne illness associated with fresh produce. About half of the fresh tomato sales in the U.S. are from greenhouses, Ilic said, as are about a third of sales of peppers. Ilic and three colleagues from The Ohio State University’s College of Food, Agricultural, and Environmental Sciences and the Ohio Agricultural Research and Development Center are currently analyzing findings from five years of research they’ve done on greenhouse vegetable production. OARDC and OSU Extension are the research and outreach arms of the college, respectively. Co-researchers are Sally Miller and Melanie Ivey, plant pathologists, and Jeff LeJeune, microbiologist and head of the college’s Food Animal Health Research Program. The scientists visited 26 greenhouses across the U.S., Canada, Mexico and Guatemala to study their operations and take thousands of samples from irrigation water, food contact and environmental surfaces, and from the vegetables themselves. The researchers found that the flow of production differs significantly between large and small operations. Ilic developed flow charts outlining each step of production, from seed propagation to postharvest treatments, and the food safety risks associated with each one. While the researchers are still analyzing their data, Ilic is encouraging growers to examine their food safety measures. Reviewing the Food Safety Modernization Act’s Produce Safety Rule requirements, particularly the Standards for the Growing, Harvesting, Packing, and Holding of Produce for Human Consumption. These can be found online at www.fda.gov/Food/GuidanceRegulation/FSMA/ucm334114.htm. Testing the water used for growing the greenhouse vegetables and for any postharvest treatment. Surface sanitation, including surfaces in the greenhouse, in the packing operation and on worker contact points, including doorknobs. Worker hygiene programs, such as handwashing policies. Consumers also need to be aware of food safety issues regarding all types of foods, including fresh produce, Ilic says. Ilic recommends consumers review basic food safety practices for handling produce — a good source is “Tips for Fresh Produce Safety” online at foodsafety.gov/keep/types/fruits/tipsfreshprodsafety.html. I Guidance includes washing hands before handling produce and rinsing produce thoroughly under running water just before eating. Produce growers and processors who want more information about updating their food safety procedures may contact Ilic at ilic.2@osu.edu.